The UFC returns with a PPV card this Saturday evening (at 6:15pm EST) from Dallas, Texas. The card is headlined by the Welterweight title fight between Tyron Woodley and Darren Till and features a few of the UFC’s brightest young prospects. There was supposed to be another title fight between Valentina Shevchenko and Nicco Montano, but that was canceled when Montano was hospitalized with issues due to her weight cut. Luckily, we still have 13 fights on the card to choose from and several of them have the potential to be high scoring in DFS. As usual, I will highlight my favorite plays in each format to help narrow down your decisions. Darren Till ($8100)(-140) vs Tyron Woodley ($8100)(+130) – I’m not as interested in this fight for DFS as I am for most main events because of the slow pace of each fighter and high expected ownership. Both fighters possess KO power but strike at such a low volume (Woodley – 2.48 SLpM, Till – 2.67 SLpM) that the floor for this fight is much lower than other 5-round fights. Over their last 8 combined fights that have gone to decision, only one of them has scored over 70 DK points, and that was Woodley with 75. We likely need a finish for either fighter to pay off their salary and the odds are -125 to end inside the distance, or about 55% of the time. 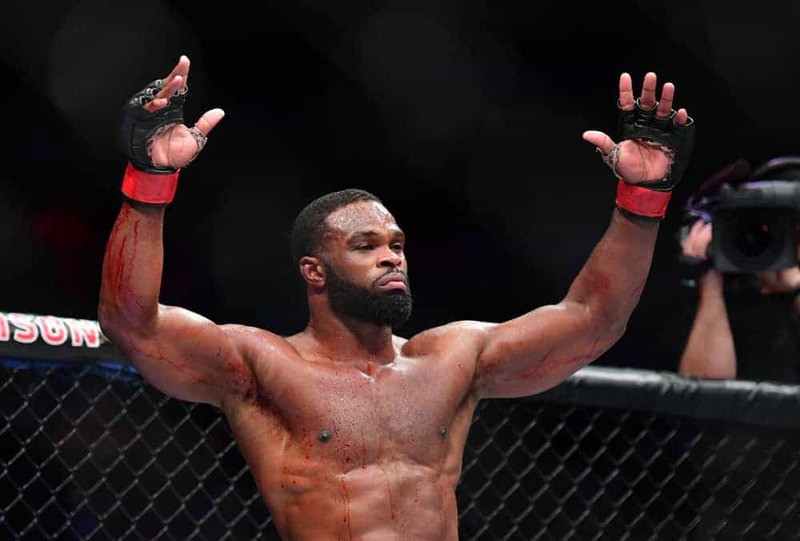 Woodley is a strong wrestler, which is appealing for DFS scoring in theory, but his cardio is so poor that he rarely attempts takedowns in fear of gassing himself out. It’s possible that he gets Till to the ground once or twice throughout the fight, but the likelihood of him landing multiple takedowns is rare. While the fight is standing, I expect Till to be the one to pressure and maintain Octagon control while Woodley backs up towards the cage looking to counter. If Till is aggressive and looks to engage then there is a chance we see an early finish, but if they respect each other’s power too much, we could see another staring contest. Woodley is big for the division but will be at a size disadvantage in this matchup as Till is a massive Welterweight. Woodley is also getting up there in age at 36, while Till is 10 years younger and just entering his prime. Ultimately these two factors push the needle slightly towards Till for me in what seems to be a pretty even matchup. The betting line has also moved in his favor throughout the week which makes me a little more confident in the pick. I wasn’t initially planning to target this fight in cash games but I’m considering it now that the co-main event is canceled. I often prefer to stack one of the 5-round fights in cash but don’t recommend it here given the low combined floor for this fight. Instead, I like taking the odds value on Till or fading it altogether. In tournaments, I expect this fight to be owned in around 70-80% of lineups, so I suggest taking an underweight approach to the field considering that we expect it to pay off just over half the time. I will have exposure to both fighters but plan to be slightly heavier on Till. Zabit Magomedsharipov ($9400)(-1050) – Zabit is the biggest favorite on the card by a wide margin now that Shevchenko is out, and he is the top projected play in all formats. He is one of the top prospects in the UFC and has impressed so far with three dominant wins since entering the promotion. Zabit is a well-rounded fighter with dynamic striking and a strong grappling game and gets a great stylistic matchup against Brandon Davis, who is filling in on just two week’s notice. Davis is a talented volume striker who loves to get into brawls but defensively he is very hittable and gives up takedowns easily. In his last fight against Enrique Barzola, Davis gave up 10 takedowns in a loss, while Zabit has landed 17 takedowns combined in his three UFC fights (with a high of 11 against Sheymon Moraes). Davis is durable, so Zabit is unlikely to win via KO, but given the skill gap in the grappling game, Zabit has a solid chance to pull off a submission. This gives him tremendous upside to go along with a very high floor in a decision. I’m jamming him in my cash lineup this week and will have heavy exposure in tournaments. Jessica Andrade ($9100)(-440) vs Karolina Kowalkiewicz ($7100)(+390) – Andrade is one of the highest scorers on DK because of her ultra-aggressive style. She strikes at an incredibly high rate (6.42 SLpM) and averages over 3 takedowns a fight. Since moving to Strawweight, she has scored over 120 DK points in 4 of her 5 wins, with a high of 155 points in a 3-round decision. Her opponent, Karolina Kowalkiewicz, is also a high-volume striker who lands at a rate of 5.64 SLpM but lacks the grappling upside of Andrade. Both fighters are hittable but durable, so you can expect there to be a ton of strikes landed if the fight plays out on the feet. Kowalkiewicz is the more technical striker and could outpoint Andrade from range, but I don’t believe she is mobile enough to keep the distance for the whole fight. Andrade is the stronger and more physical fighter, so I can see her getting to the inside and landing takedowns. The fight is expected to go the distance, but I wouldn’t be surprised if Andrade was able to get a submission at some point. She’s a BJJ black belt and Kowalkiewicz has struggled on the ground, having given up her back on multiple occasions. Andrade is one of the best plays on the card in both formats (only slightly behind Zabit for me) for her high floor and ceiling. If you need salary relief in cash games, I don’t mind using Kowalkiewicz since she has a high floor in a decision loss. I’m even considering stacking this fight in cash now that the co-main event is canceled. Abdul Razak Alhassan ($8300)(-120) vs Niko Price ($7900)(+110) – This card is full of high-upside options but the fight I want to have the most exposure to in GPPs is the one between Alhassan and Price. Not only are the salaries appealing, but both fighters are known finishers and this fight has the best odds of ending inside the distance. Alhassan is aggressive early in fights and throws everything with power. He is 9-1 with all 9 wins coming in the first round and lost his only fight that went the distance. His style causes him to gas if he can’t put his opponent away early and Price should have the advantage if he can avoid the early onslaught. Price isn’t the most technical fighter, but he has some power and a good submission game if he can get the fight to the ground. He’s somewhat hittable but has shown some durability throughout his career. This is a high-variance matchup that could go either way, so I want to have exposure to both fighters and it’s a spot that I’m considering going all in on in GPPs. If you’re only playing one lineup I would lean slightly towards Alhassan because he is the more likely of the two to finish in the first round. Geoff Neal ($8700)(-185) vs Frank Camacho ($7500)(+160) – I’m planning on spreading around my exposure to the underdogs this weekend, but Camacho is my favorite option below Niko Price because of the incredible pace to his fights. Camacho is a brawler who strikes at a very high volume (6.56 SLpM) but is also very hittable (7.62 SApM). He’s super aggressive early in fights and gasses if he can’t get the finish (much like Alhassan). Camacho scored 120 points in a win over Damien Brown and an impressive 82 points in a decision loss to Drew Dober. His floor is very high in a decision and his chin has held up so far in the UFC. Neal hits a lot harder than Dober and Brown but isn’t as experienced as Camacho and has only faced lower level competition. He’s been finished in the third round of both his losses, so Neal will be tested if he can’t finish Camacho early. While I prefer Camacho for the price, I plan to have some exposure to Neal in GPPs as well, given Camacho’s lack of defense. Craig White ($8800)(-210) – White is not a good fighter at all but he’s worth a look in GPPs as a heavy favorite over the aging veteran, Diego Sanchez, who appears to be completely shot. White has a mediocre 14-8 record and has amazingly never been to the third round as every one of his fights has ended in a finish. He has sloppy striking and doesn’t have a great chin but comes in with a 4” reach advantage and should be the much bigger fighter in this matchup. It doesn’t take much to put Diego to sleep these days so if White can keep the fight standing, he should have a great chance to land the early KO. He’s hard to trust because he has a poor fight IQ and likes to flop to his back a lot (which would be a terrible strategy in this matchup) so I’m going to be cautious in this spot, but his upside is hard to ignore. I might hedge this spot with a few Diego lineups in case White blows it, but I don’t think he has enough upside to have much exposure to.